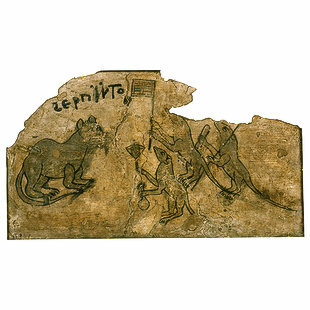 This piece of fresco is a cartoon drawing of a delegation of mice sent to ask forgiveness from an arrogant cat. The three mice are fat. The first mouse is carrying a pack and a pencil made of reed. This mouse seems to be the secretary of the delegation. The pack probably contains letters of entreaty. The second mouse is the leader and is carrying a flag. The third has a flask of red wine and a bag of grain. Above the cat a word is inscribed in Coptic. The cat is a symbol of mockery, because the mice represent the people and the fat cat represents the ruler. The mice come to the cat entreating him to make peace with them, a thing that will never happen! The drawing represents the state of the country under Byzantine rule. This piece of art is from Bawit and represents a continuation of ancient Egyptian cartoon art. A similar piece of art is a papyrus in the British Museum, which has a drawing of a gazelle playing an ancient Egyptian form of checkers with a lion; this dates from the New Kingdom. Another piece in this style is from the city monastery and is on show in the Berlin Museum. It represents a cat in front of a monkey. Yet another piece from Hildesheim Museum is the drawing of a mouse sitting at a table eating a duck, while on the other side of the table is a cat.